Patrick was born in Scotland. His father was a Roman Centurion and also a deacon in a local New Testament church. Patrick was captured and taken to Ireland as a slave, but he escaped. After his conversion to Christ, he studied on the mainland in Gaul and then returned to the heathen tribes in Ireland as a missionary. 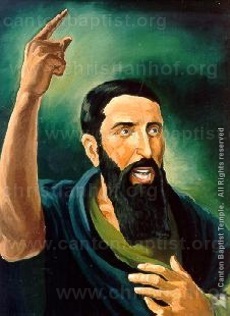 He began scores of churches and baptized (immersed) thousands of converts. He is largely responsible for the large number of Bible-believing Christians in Northern Ireland, Scotland, and England. Patrick, his father and his grandfather were proud of the fact that they were not controlled by the Roman church, and that they were responsible only to God. Patrick was later canonized by the Roman church as a political move to control the Irish churches. He was thereafter known as Saint Patrick.